Hashbot - Forensic web tool to acquire and validate the web pages ! 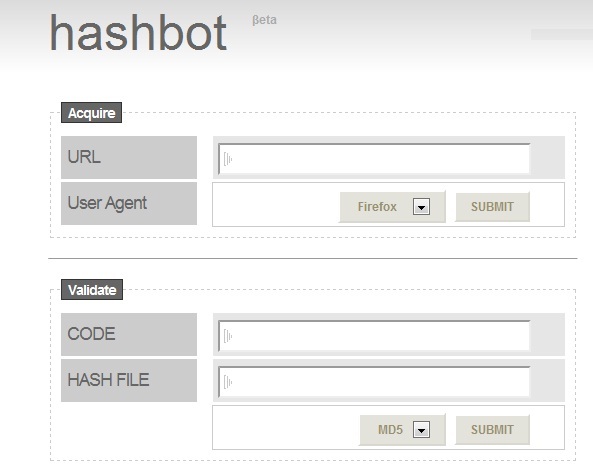 Hashbot is a forensic web tool to acquire and validate, over time, the status of an individual web page or web document. Insert the document's URL (ie: http://www.evilwebpage.com/image.jpg or http://www.evilwebpage.com/page.html) in the text input. Select your favorite user agent. Click on Submit. A captcha code will be required, for security reason. Wait for acquisition service finish and click on download to save the result. Validation informations are stored in the -code.txt file in "Validate Info". Insert the keycode in "CODE" field. Insert the file hash chosing between MD5 or SHA1 in the "HASH FILE" field. Select the file hash type according with the hash type filled in the previous field. Click on Submit. A captcha code will be required, for security reason and wait for server response.